Anyone can sell you stock rebar in the size you need and ship it your way. At PJ's Rebar, we offer high quality, high strength rebar as well as complete fabrication services to give you finished rebar that matches your exact requirements. We do the work so you don’t have to! We offer full-service fabrication for all standard-sized rebar from #3 to #18. We carry special dual-grade rebar (A-615/A-706) that combines the strength and other physical characteristics of Grade 60 rebar with the easy weldability of A-706 rebar. Rebar of other types and grades is available upon request. 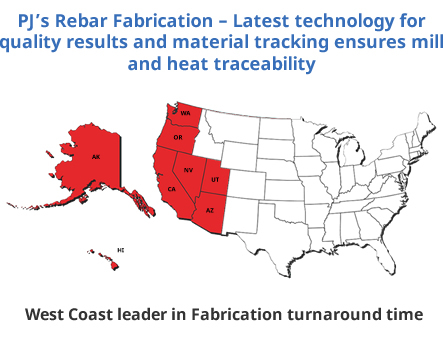 Our rebar fabrication capabilities include shearing, bending, spiraling, and more. We can also provide custom, preassembled rebar structures like cages, columns, footings, and more. We work with coiled rebar and standard 60’ rebar long stock, as well as 20’, 30’, and 40’ lengths, and will cut to length per your specifications. We take special care to minimize scrap, which saves you money in material costs. All our fabrication processes are performed in-house by our skilled, experienced team to ensure quality and consistency. With all these services available under one roof from a single supplier, you’ll save time and money, and avoid hassle on your project. No more waiting for your rebar to make it from Point A to Point B for fabrication. No more cutting multiple checks for one component of your project. And no more struggling to cut and fit your rebar in the field. 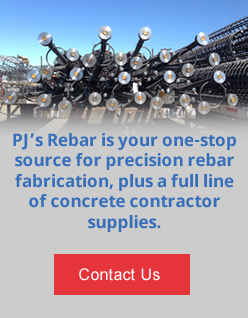 Request a price quote on fabrication for your #3 to #18 rebar, or contact PJ's Rebar for more information.